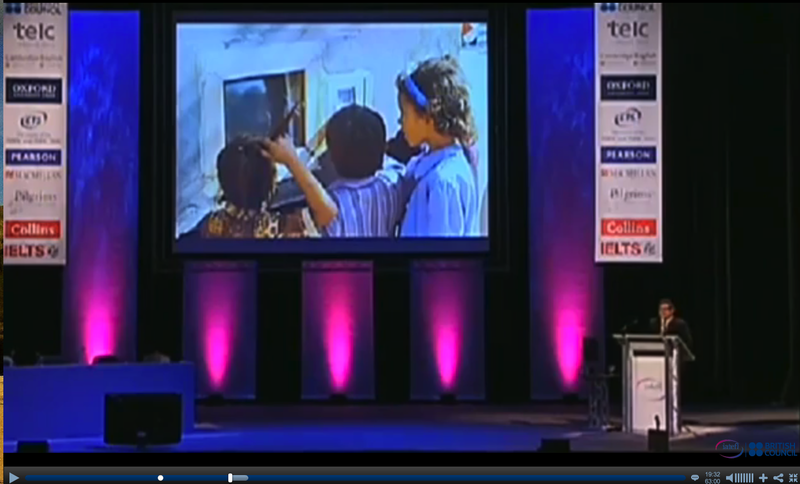 Last Saturday Sugata Mitra gave a plenary at an international teachers’ conference. When it was over a proportion of the audience gave him a standing ovation, but an equal number refused to get to their feet and a proportion of the ‘remaining seated’ crowd expressed outrage and fury at what they had heard and seen. He was an angel. He was a devil. You can watch the plenary in question here, and you can read Graham Stanley’s careful response here. I have blogged about Sugata Mitra before in reference to his TED talk – and his plenary at the IATEFL 2014 conference over a year later was not significantly different from his TED appearance. And back then, like most speakers at TED conferences, Mitra was encouraged speak passionately and idealistically about something he believes in – and something which promotes technology’s ability to answer all problems – and to be sure of a rapturous reception. TED audiences only have to listen to 20 minutes or so and are primed to accept all visionaries as, well, visionaries. It’s like being at an advertiser’s pitch where everything sells and there are no problems with what is being said. A group of practicing teachers (all of whom wrestle daily with issues about education, educational restrictions and how people learn) presented him, I suspect, with something more of a challenge. Briefly (because you can find out what he thinks in many places). Mitra advocates SOLEs (self organized learning environments) where children group round computer terminals to find answers to big questions such as ‘why do men and not women have moustaches?’ or ‘Did dinosaurs really exist?’ He reminds us that children are capable of learning a lot by themselves in this way – much more, perhaps, than in a traditional transmission-based classroom. And in situations of educational deprivation, especially, if we can make that information available online the sky is, literally, the limit. Mitra promotes schools ‘in the cloud’ where children who have no (or unenthusiastic) teachers can learn and develop in an internet-rich utopia. Thus he has set up computer centres in rural Indian villages and UK schools, and these centres can be visited virtually by ‘grannies in the cloud’ (an unfortunate nomenclature in my opinion) by which he means older adults with time on their hands who can probe the children’s knowledge, interact with them, enccourage them, show them things etc. In his post-plenary interview in Harrogate he says that one of the roles of such cloud grannies is to say well done etc. My description doesn’t do justice to the heady excitement of what he has to say. I am not immune to it. The idea that if you prime children properly and give them the right tools there is no limit to what they can do is tantalisingly enticing. Such child-driven learning is, according to the SOLE toolkit ‘self-organised, curious, engaged, social, collaborative, motivated by peer interest, fueled by adult encouragement and admiration’. Not only that, but the dream of bringing such education benefits to disadvantaged communities is intoxicating. No wonder he has won prizes and is garlanded with flowers. 1 Any teacher with experience knows that it is one thing to put educational temptation in a child’s way (or an adult’s); quite another for that student to actually be tempted. Mitra’s claim is that this always works, a kind of learner autonomy nirvana. Yet we know this is just not true. Some students try to be autonomous and some don’t. Some succeed and some don’t. In any group different roles are played; not all learners learn equally. There is nothing wrong (and everything right) with discovery-based experiential learning. It just doesn’t work some of the time. Yet Mitra’s discourse includes no doubts or caveats. His well-rehearsed and extremely effective ‘show’ exists in TED-land, not in a discussion of teaching reality. 2 What good teachers know is that the precise nature of teacher intervention is crucial. Our job is to keep students on task, help them to focus, help them when they are having problems, find different solutions as problems emerge, be a resource and a prompter, a motivator – and much more. I hear little about this from Sugata Mitra except for the general role of cloud grannies to use their apparent ignorance to get kids talking, and their encouragement. Yet the pedagogy of what he claims to be (remember, this claim is important) revolutionary needs to be considerably more fleshed out than this. What interventions are successful and which are not? What precisely is the role of a cloud granny and how can she (or perhaps he) make the whole experience more productive. 3 Sugata Mitra claims, perhaps jokingly, that we don’t need to know things any more because it is all available online. This goes hand-in-hand with his belief that the education system is ‘outdated. We don’t need it any more’ (in his TED talk). Yet without our accumulated knowledge and memories what are we? Our knowledge is, on the contrary, the seat of our intuition and our creativity. Furthermore, the gathering of that knowledge from our peers and, crucially, our elders and more experienced mentors is part of the process of socialization. Humanity has thought this to be self-evident for at least 2000 years and though it is the responsibility, perhaps, for younger people to constantly challenge the status quo, still that social interaction between experience and inexperience, age and youth etc is the way society grows and how children become socialized. Grannies in the cloud? To give Sugata Mitra deserved credit, that’s a lot better than nothing. As an alternative to decent schooling? I don’t think so. I am a paid-up technophile and love what technology allows me to do and experience in our present reality. But as Gavin Dudeney has said (again!) it’s not the issue, especially when it is being used to promote dodgy pedagogic practices. I do not accuse Sugata Mitra of that. But I do accuse him of oversimplifying complex issues of pedagogy to offer an over-idealistic technology-fuelled solution to everything. Angel? Devil? Almost certainly neither of the above, but what do YOU think? In a radio programme I was listening to while I had lunch they were discussing whether it is OK – or even a good thing – to say “I don’t know”. Professor Kathy Sykes told of how she only had success with her Zimbabwe maths and physics students when she admitted that she didn’t know and so “let’s try and find out together.” It made me think back to last Sunday when I was listening to a commercial presentation about a new series of books called Q which are apparently based on the premise that critical thinking is at the heart of successful language learning and teaching. And then this evening another radio programme, as I work, is talking about Taoist philosophy in which Yin and Yang are major features. In the words of a Wikpedia entry “Yin and Yang complement each other: like an undertow in the ocean, every advance is complemented by a retreat”. What am I talking about? Critical pedagogy, that’s what. The constant battle between knowledge (I know) and the questioning of knowledge (I don’t know but I want to know). Should teachers impart knowledge or provoke knowledge enquiry? Should they offer certainties or uncertainties? Should they teach things or provoke things? It’s easy to answer, right? We all believe in critical thinking as the way to understanding. Questioning brings understanding; transmission teaching stifles it. Yet, as I said, it is Christmas and it is around this time of year that somehow my own critical questioning goes quiet. I forget my challenge to the myths that inform Christian religious belief and find myself accepting, unquestioning, an experience (though in my case not the belief) that is encompassed in the seasonal music that I love. Should I be embarrassed about this? Or – to bring this post round towards teaching and learning– should we object when students want certainties rather than provocation? For example, should we (in a very western way) feel uncomfortable about the rote learning that helps Chinese and Japanese students to learn X number of characters a week or should we question our own belief in learner autonomy? This issue came up in my last post about Dogme – the difference between acquisition vs participation. You might say that some things need to be taught (acquired knowledge) and some things need to be discovered through critical thinking (participation). That’s a Yin and Yang kind of argument. But in the era of Google does it make sense? If we believe in the democratisation of education can we be happy with this?